When this comprehensive volume of practical information was first published in the 1920s, hundreds of thousands of motorcycles were already in use. 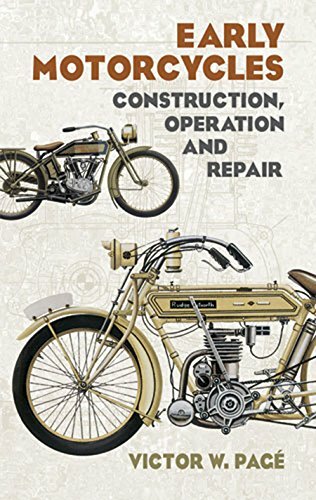 Written by a talented automotive and aviation pioneer, the profusely illustrated, easy-to-read book was one of the first exhaustive studies done on motorcycle operation and repair, offering advice on everything from mufflers and automatic oil pumps to batteries and timing values. Following an introductory chapter on motorcycle development and design, the profusely illustrated text covers, among other subjects, various engines and power plants; theories of lubrication and carburetor design; materials employed in clutches; gear types and chain drives; frame parts, tires, and sidecars; standard motorcycle maintenance; and complete instructions for overhauling the engine. Also included is a complete chapter on the most up-to-date motorcycles of 1920. Immensely popular when it first appeared in print, Early Motorcycles will appeal just as much to today’s collectors of antique cycles, dealers, and riders.